The integration between OroCRM and OroCommerce provides seamless experience of two applications working as one. OroCommerce comes with OroCRM integration enabled out of the box. If you are using OroCRM, you can install OroCommerce on top of it and enable the integration. Oro application shares the baseline and combines capabilities of multiple applications and packages that does not change the overall look and feel of the system. As the result of OroCommerce integration with OroCRM, the application menu is combined, displaying options from both OroCommerce and OroCRM. OroCommerce customers are treated the same way as OroCRM Business customers. Their data and business transactions are displayed on the Account page, and their activities are added to the account’s activity list. Lifetime sales values metric is calculated for OroCommerce customers based on orders placed. The following illustrates an example of an account for Commerce customer. When a customer is created or edited at backend, the account can be specified directly. When a new customer is self-registering at frontend, a new account of the same name will be created automatically. In case of installation of OroCRM over an existing OroCommerce instance, new accounts are automatically created for all existing customers. create a separate account for every customer regardless of their parent-child relations with other customers. These options can be changed any time with customers re-related to accounts accordingly. You can create opportunities for your OroCommerce customers. Opportunities can be related to OroCommerce customers. This allows sales representatives to track their ongoing deals and forecast future revenues for all sales that will be conducted via the OroCommerce website by relating the opportunity to the respective OroCommerce customer record. 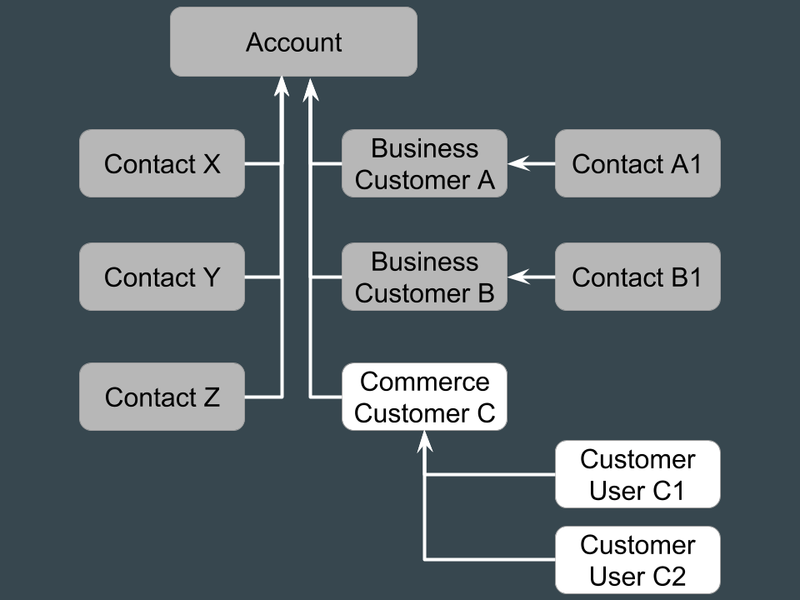 Account and Contact come from CRM, while Customers and Customer Users come from Commerce. An account and a customer represent a company or a division. A contact and a customer user represent a real person who acts on behalf of the company. This has been implemented to track this hierarchy independently if CRM or Commerce are installed separately. When both are integrated, additional options to source and retrieve the data become available. You can use the modules separately; for example, if employees work with OroCRM, they can refer to accounts and contacts while those working with OroCommerce can work with Customers and Customer Users. In both cases, they have the ability to track information about companies and people. Even though the information in Account, Contact, and Customer may seem similar, there is a significant difference that shows the advantage of using CRM and Commerce together. An account aggregates data from all channels (CRM, Commerce, or others) and all sources (e.g., Contacts, Business Customers, Commerce Customers) providing a 360-degree view of all the information about the company. All interactions with a particular customer are displayed on a single page where you can also track sales though opportunities. A contact is a CRM concept that is used to associate a person with a specific account. It contains a contact’s personal information, their position in the company, address information, and other related data. The main difference between a contact and a customer user is that a contact represents a person who may not use the Commerce segment (for example, the CEO of a company who does not buy anything personally). OroCommerce Customers (from Commerce package) are used to represent OroCommerce-specific data, such as Commerce Customers, Commerce Customer Users, Shopping Lists, RFQs, Quotes, Orders, and Opportunities. Business Customers (from CRM package) are used to represent Business Customers who are not Commerce Customers and also CRM-specific data, such as B2B Customers, Contacts, Leads, Opportunities. Magento Customers (from CRM package) are used to represent customers related to a Magento store. Additionally, you can associate Lifetime Sales Value with a customer and track financial statistics related to a specific customer or account. Below is an illustration of the account hierarchy where CRM-related concepts are marked grey, and Commerce-related concepts are marked white. For more details on the purpose of using each entity separately, check the Understanding Accounts, Channels, and Customers topic.